Offenders from the correctional services have responded positively to His Majesty’s call as hundreds have confirmed their interest by registering for this year’s upcoming national elections. The national exercise which commenced on Sunday was received with utmost jubilation by both officers and inmates who were on Monday, visited by the Elections and Boundaries Commission in various centres. The Commission, which has set a schedule for registering all qualifying inmates, is geared to visit all 14 centres of the department having started at the Correctional Staff College on Sunday. Commissioner General of Correctional Services Isaiah Mzuthini Ntshangase, who has also registered for the elections, expressed gratitude to His Majesty the King for ushering a new era in the department by allowing inmates to take part in the national elections. 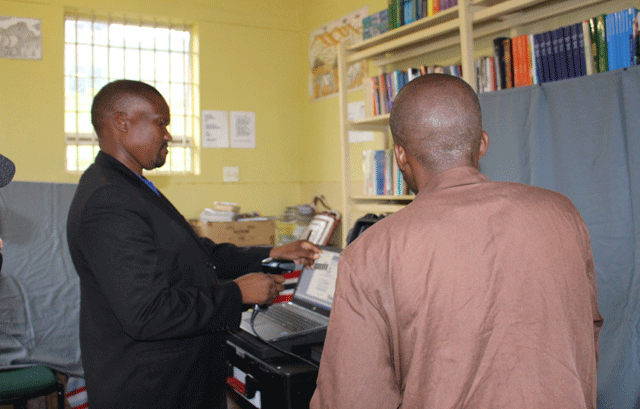 As the department aligns itself with international correctional standards, Ntshangase said inmates across the various facilities have been allowed to register through the assistance of the Elections and Boundaries Commission. He said the casting of votes by offenders constituted their right as human beings and members of society. This means that inmates will now take part in the voting exercise which is expected to commence in the not so distant future. Ntshangase explained this initiative as a major development as other countries undertake this practice. The commissioner general, who applauded the positive response from inmates, also pleaded with relatives of offenders who may wish to provide identity documents for their loved ones to pay visits during the stipulated visitation times. He said some offenders left their documents home, thus requesting relatives to provide for such so that all qualifying inmates could register. Correctional centres currently hold about 3 500 offenders. Ntshangase, who also took the lead on Monday and registered for the elections, said it was important to remain united as a nation in building a better future for the country. As the nation was heading for the first world, he said inmates, like all citizens, will vote for Members of Parliament who will represent them in their constituencies in formulating policies that will help the country develop. Ntshangase explained that incarceration does not deter one from exercising their right as community members. He said in as much as they were serving their sentences, offenders where only admitted to punishment by serving time in the different correctional facilities and not to be deprived of their rights. Ntshangase then took time to encourage officers from the department to register for the elections. He applauded those who have already done so, especially in the centres that have already been visited by the EBC.These centres are Correctional Staff College, Correctional Headquarters, Mbabane Correctional Centre and Mawelawela Correctional Centre.